Illustrations: 28 duotones. Iocolor to handle pre-press. But then what is your myth-the myth in which you do live? AFTER HIS EIGHT-YEAR-OLD daughter Kitty finished the 1907 school year and his small gallery on Fifth Avenue closed down for the summer, Alfred Stieglitz gathered his family, along with Kitty's German governess, Clara Lauer, for their second excursion to Europe. Sailing on the luxurious Kaiser Wilhelm II, the Stieglitz clan settled into their comfortable first-class berths. After two boring days of burrowing in his deck chair with his eyes closed to screen out the nouveau-riche socialites who mindlessly chattered around him, Stieglitz took to his feet and roamed the boat to avoid the crowds and his fashion-conscious wife. On the prow and steerage deck the third-class passengers were basking in the sun and trying to fight the nausea brought on by the rough seas and fetid, garbage-littered sleeping quarters below. From his safe perch at the end of the walkway, just outside the stuffed chairs of the reading room, Stieglitz looked down on young women airing linens and tending children and across to the more adventuresome crowd gathered at the highest and most forward point on the boat. Then, in a "eureka" moment that stayed with him the rest of his life, the scene before him sparked a surge of emotion: "I stood spellbound for a while, looking and looking. Could I photograph what I felt, looking and looking and still looking? I saw shapes related to each other. I saw a picture of shapes and underlying that the feeling I had about life." Rushing back to his cabin to get his Graflex camera and his one remaining unexposed plate, he returned to find the "picture" he had seen still there. The shot was taken, the plate developed after the family arrived in Paris, and the print known as The Steerage emerged from the developing bath back in New York in the fall (figure 1). "If all my photographs were lost and I'd be represented by just one, The Steerage, I'd be satisfied," Stieglitz recalled himself saying some time later. This detailed invocation of the making of a photograph-a photograph that for its creator encapsulated a life's work-is one of many tales Stieglitz spun for the entranced visitors who gathered around him in the modest galleries he ran in New York between 1905 and 1946. It is not known when he began crafting "How The Steerage Happened" (as well as two additional episodes tracing the subsequent fate of the photograph, "The Magazine 291 and The Steerage" and "The Steerage at Weyhe's"), but he was still telling the story to friends in 1940. His disciple and lover Dorothy Norman published the fullest version, along with many other memoirs from his early life based on "over one hundred stories dictated by Alfred Stieglitz without any idea on his part that they were to be printed," in her magazine, Twice a Year, as an homage to an aging legend in 1942. A second transcription, somewhat abbreviated and differently worded, appeared in her 1960 encomium, Alfred Stieglitz: An American Seer. Herbert J. Seligmann, claiming to be working from notes taken on November 1, 1926, offered the most condensed variation in his Alfred Stieglitz Talking: Notes on Some of His Conversations in 1966. Despite subtle shifts in phrasing and the addition of more self-reflective comments in the 1942 version, these three texts define a master narrative, consistent down to specific turns of phrase and evocations of the emotions that swelled within the photographer. In the explosion of critical writing about Stieglitz after his death in 1946, extracts from these published versions were repeatedly cited as evidence of the photographer's groundbreaking invention of a modernist, abstract, "straight" photography in which form, rather than depicted content, was of primary concern. Despite some quibbling about the details of the account and Allan Sekula's important deconstruction of the story as "pure symbolist autobiography," the narrative, through repetition in popular books such as Beaumont Newhall's History of Photography: From 1839 to the Present Day (first written in 1937 and expanded through many editions), acquired the weight of truth. Stieglitz's declaration that "another milestone in photography" had been reached became a self-fulfilling prophesy: marked by Stieglitz's vivid narrative as a turning point in his career, the photograph was reproduced in every textbook and hailed as a canonical symbol of American greatness. But, when looked at without the rosy-tinted lenses of Stieglitz's fond memoirs and the enthusiastic accolades of his biographers, The Steerage can seem oddly pedestrian. Known today only through gelatin silver prints made in the 1920s and 1930s and variously enlarged gravures that can be dated to 1911, 1913, and 1915, The Steerage flaunts its geometric structure, defined by the white slash of the painted gangplank that splits the dappled crowd; the thick mast rising toward the upper left; the spatially ambiguous, raking hauling boom that presses down on the heads of the figures; and the metal stairs leading nowhere on the right. Its emphatic, two-dimensional composition is harmonious and balanced, but no more striking than that of Stieglitz's earlier prints, such as On the Ferry Boat (1902), The Flatiron (1903), and Going to the Start (1904), in which silhouetted, flattened linear shapes repeat and emphasize the edges of the frame. Furthermore, crowded steerage passengers, the "huddled masses" of Emma Lazarus's already famous poem of 1883, had been recorded with increasing frequency in the early twentieth century by countless amateur, news, and documentary photographers intent on exposing the hardships facing a growing mass of poor and illiterate immigrants. Can we believe that Stieglitz, in 1907, considered The Steerage the epitome of his life's work? And, more important, why did he feel compelled to compose a story, firmly in place by the early 1920s, that painted him as a lonely outcast who, on the third day, rose again from the spiritually dead to find salvation among the common people and in the beauty of his own creation? Far from being a factual account of how The Steerage was made in 1907 and subsequently greeted by the public, the text published in 1942 is a selectively remembered, carefully crafted, and embellished parable consistent with the endless outpouring of words that flowed from Stieglitz's pen and mouth throughout his career. It forms part of a personal mythology, described by Carl Jung (an author whom Stieglitz admired) as a series of stories that individuals invent to make sense of their lives. Upon closer scrutiny, the events that Stieglitz recalls are suspect, his motivations for taking the picture are suppressed, and his interest in the scene determined by his position in the 1920s rather than in 1907. In addition, what he actually did write about his reasons for taking the picture has been misrepresented by subsequent scholars, who have drawn selectively from the 1942 article to justify condemning or praising him as a formalist. Although there is certainly no single or "true" reading of this photograph and its justificatory text, we can measure them against one another and against external evidence to uncover the unresolved conflicts in Stieglitz's personality. What emerges tells us a great deal about how The Steerage and the retelling of its creation functioned as screen memories, ostensibly confirming Stieglitz's prowess as a photographer, hatred for consumerist society, and humanitarian desire to be one with the lower classes, while repressing his anxieties about his social status, sexual performance, and lifelong accomplishments. IN THE SPRING OF 1907, Stieglitz by all accounts was feeling dissatisfied. He had not done much photographic work in several years and was mostly cycling older prints through foreign exhibitions. Editing Camera Work and mounting new shows, including his first display of contemporary drawings at the Little Galleries in January, kept him busy but out of the darkroom. The most exciting recent photographs he'd made that spring were a series of experimental nudes, shot with his friend Clarence White and two local girls who were willing to assume graceful poses adjacent to Japanese ceramics and potted plants as long as the prints were blurry enough to hide their identities. White knew about photographing nudes, but Stieglitz had steered clear of the subject since his student days. Whereas White's wife was comfortable with letting him pose her in the buff in front of the window or even outdoors, Stieglitz's Emmeline never agreed to such liberties and would have been suspicious of her husband's interest in undressed models. Stieglitz always greeted the end of the gallery season with relief: the city exhausted him, and he relished returning to better air and greener vistas, later to be satisfied by extended stays at his family's home at Lake George, New York. A trip to Europe with the family, however, promised to be less than relaxing. Stieglitz had lived in Germany from 1881 to 1890, but since his marriage in 1893 had returned only for a belated honeymoon trip in the summer of 1894 and his first excursion with wife, child, and nanny in 1904. The decision to cross the Atlantic in 1907 was influenced by a number of forces, primarily Emmeline's desire for Parisian shopping and visits to her German relatives; it was not something that he was looking forward to. As Stieglitz wrote to the photographer Heinrich Kuhn in March, "For two years my wife has been absolutely against my work. I have never discussed it and don't want to go into details.... So you see, dear friend, since the European trip will be principally a pleasure trip for my wife, I can make no plans for myself." Stieglitz's marital stress, manifest in his hypochondriacal ailments, led him to complain to the San Francisco pictorialist photographer and health nut Anne Brigman, who advised him in April 1907 to pack in his trunks Annie Bryson Call's book Power through Repose, a guide to better relaxation through mental and physical exercises. Stieglitz filed a passport application on May 11 and cast off from the Hoboken docks of the North German Lloyd Line on May 14, not in early June as he later recalled. The Kaiser Wilhelm II, the "fashionable ship" that his wife insisted on taking, left only once a month from New York, and the ship's next sailing was June 11. But Stieglitz's friend Joseph Keiley had already gotten a card from him sent from the boat by May 24, and had received a letter from Paris mailed on May 28. If one accepts that the identification of the ship is correct (it can be confirmed only that Stieglitz returned to New York on September 24 on the Kaiser Wilhelm II), then his memory of the date is inaccurate. His characterization of a liner crowded with "nouveaux riches," whose faces and vulgar English gave him "cold shivers," accurately reflects the clientele of one of the world's fastest and most luxurious transatlantic vessels. Modeled after the first four-funneled steamer, the Kaiser Wilhelm der Grosse, launched by Kaiser Wilhelm II in 1897 as a symbol of German technological supremacy, the Kaiser Wilhelm II, whose maiden voyage began on April 14, 1903, was even bigger and faster. Measuring 707 feet in length, the North German Lloyd ship set the eastbound speed record-an average of 23.58 knots-after being refitted with new propellers in 1904. Matching its claims of being the biggest and fastest, the boat housed its 775 first-class passengers in 290 cabins, each sleeping from one to four passengers, and boasted two imperial suites, eight luxury cabins, and four cabins with adjoining bathrooms. Stieglitz and his family ate in a dining room that seated 554 persons and could stroll in a smoking room, drawing room, children's saloon on the lower promenade deck, two cafes, and a reading and writing room on the upper promenade deck (figure 5). Although rumors of a new, bigger, and faster ship commissioned by the Cunard Line, the Lusitania, had hit the press in the days before Stieglitz's voyage, the Kaiser Wilhelm II jealously guarded its reputation as the most comfortable and rapid mode of transport to Europe. The passengers attracted to the North German Lloyd behemoth were not only those who prided themselves on taking the state-of-the-art luxury vessel, but also those Americans of German heritage who appreciated that the crew, owners, and cultural amenities of the boat were German. Although the Stieglitz family did not warrant mention in the society columns, the papers noted that their fellow passengers included members of the German nobility and diplomatic corps (Baroness Loeffelholz von Colberg, General von Lowenfeld, the Prinz von Sachsen-Coburg, Count von Hatzfeld-Trachenberg); successful German-born merchants who had carved empires in brewing, like Stieglitz's wife's family (Adolphus Busch of St. Louis, George Ehret of New York) or retailing (Louis Stern of Stern Brothers department store, Ewald Fleitmann); German-speaking lawyers and financiers (George Burghard, Anthony Drexel of Philadelphia); and German cultural celebrities (the singer Marcella Stengel-Sembrich, the Boston Symphony Orchestra conductor Karl Muck). Stieglitz's complaint about "those voices, and that English-ye gods!" is an underhanded reference to the Yiddish- and German-inflected accents of most of the people with whom his wife socialized. Perhaps the most famous fellow travelers were William Ellis Corey, the self-made president of U.S. Steel who had settled a million dollars on his wife to get a Reno divorce in 1906, and Mabelle Gilman, the actress he had wed at 1:30 A.M. the very morning of the ship's departure. The Coreys were wafted in the dead of night from their wedding supper to the captain's suite, where they were attended by four ship's stewards, a valet, and a maid, and would not "be obliged to mingle with other passengers on the Kaiser Wilhelm II, unless they so desire." Where Stieglitz drew the line between the "old" and "nouveau riche" is unknown, since his and his wife's families certainly had accumulated their wealth during the previous thirty years, but undoubtedly the excesses of the likes of the Coreys embodied the mixture of ostentatious consumption and vulgarity that caused Stieglitz to bury himself under a blanket in a deck chair. Stieglitz's discomfort with the rich may have also been heightened by events immediately preceding his departure. The Kaiser Wilhelm II suffered a series of well-publicized setbacks during the week before the Stieglitzes were booked to leave. As the ship passed by Nantucket heading down to New York, it almost hit another German cruiser traveling toward Boston. By the time it approached the Hoboken docks on May 7, four thousand longshoremen in Hoboken and Manhattan, including six hundred employees of the North German Lloyd Line, had walked off the job, demanding more pay. The captain was warned not to approach the Hoboken dock, and told to anchor overnight at Quarantine, the wharf set aside for inspection of individuals suspected of carrying contagious diseases. In the coming days, the strike spread and violence increased: freight handlers walked out on May 10, and the longshoremen predicted that the teamsters and the grain elevator operators would walk out in sympathy with the twenty-five thousand longshoremen striking in New York and New Jersey. Thanks in part to scab labor, the transatlantic liners were still managing to leave more or less on time, and the general manager of the North German Lloyd Line assured the public on May 11 that "[a]ny report to the effect that the transatlantic lines will effect a compromise with the striking longshoremen ... is absolutely groundless. The North German Lloyd will most assuredly fight this strike to a finish." The day of the Stieglitzes' departure, the North German Lloyd spokesman asserted in the New York Times that the newly hired men were working well and the "Kaiser Wilhelm II was fully coaled and loaded and would sail to-day." With police, strikebreakers, and striking men warily eying one another on the docks and longshoremen swearing to stand up to the big transatlantic companies (the strike did not end until June 13), the first-class passengers nervously boarded, while some 343 second-class and 770 steerage passengers passed down the gangplanks reserved for them. Stieglitz apparently did not stop long to settle into his cabin but immediately came out to capture the exciting departure from the pier and the view across to Manhattan. According to a letter sent to Stieglitz in Europe by fellow photographer Alvin Langdon Coburn, "Hope you had a good trip. You were altogether too busy snaping [sic] the new Kodak to wave your hand at us from the steamer as it pulled out, but I got you [sic] p.c. [postcard] which came back with the pilot." This letter is telling, not only because it indicates that Stieglitz was shooting photographs from the time he boarded the ship, but also because of its reference to his "new Kodak." Stieglitz mentioned in his later account that The Steerage was made with a Graflex, one of several single-lens reflex cameras sold under that name that he owned by 1906 in which a mirror reflected an undistorted image onto a ground-glass screen at the top of the camera that was visible thanks to a leather focusing hood. The camera, which had to be supported with both hands and pressed against the waist for stability while focusing, was much larger than famous Kodaks such as the Bull's-Eye or Brownie series and was at the heavy end of portable handheld models. Coburn might have dubbed the Graflex a "Kodak" because the Folmer and Schwing Manufacturing Company, which had introduced the camera in 1899, had been bought by Eastman Kodak in 1905. Or, one could posit that Coburn was referring to another, as yet unidentified, smaller-format Kodak camera that Stieglitz had just acquired before the trip. Coburn's image of Stieglitz as a busy snapshooter jars with the present-day tendency to contrast Stieglitz (and the Photo-Secession, which he helped to found in 1902) with the tasteless amateurs who embraced the medium after the mass marketing of cheap handheld cameras in the 1880s. But this distinction has always been less clear than either the self-justifying rhetoric put out by the Photo-Secession or the subsequent assessments of photographic historians would suggest. Although he fulminated against George Eastman, Stieglitz had won prizes in Kodak competitions held in 1905 and 1907 and allowed his works to appear in traveling exhibitions sponsored by the company. He also promoted the Graflex and other Kodak products on the pages of Camera Work. And in recording memorable events involving his family and private life, he often embraced subjects dear to amateur tourists or proud parents, albeit with different compositional strategies. On all his trips to Europe, Stieglitz, like passengers wielding Kodaks, had taken pictures on the boat during the passage. In 1894, on his belated honeymoon trip to France on the S.S. Bourgogne, he made a self-consciously artistic, abstracted view of the foaming whitecaps behind the boat that he titled Mid-Ocean, suggesting his isolation and the unfathomable grandeur of nature. More sociably, he posed his wife, his good friend the painter Sime Hermann, the Washington landscape painter Parker Mann and his wife, two other saloon passengers, and the attractive actress Lotta Linthicum on the upper deck (figure 6). Ensconced in their heavy blankets, the group pretended to be reading or conversing, while only the poised and comely Miss Linthicum smiled out at the cameraman. She became the willing subject of a second study, leaning against the railings in her elegant toque and fur-trimmed coat and gracefully clasping a floral sprig. Enlarged onto platinum paper and exhibited as Outward Bound, the photograph commemorated a brief flirtation under the guise of a celebrity portrait. In 1907, Stieglitz had been shooting during the early days of the crossing, as he let slip in his account of The Steerage and as Coburn's letter confirms. He had used up the plates he brought with him, possibly making views of friends at his wife's behest as well as another deck scene of his traveling companions (figure 7). His daughter Kitty smiles pertly at him at the center of the frame, flanked by a distracted Clara Bauer and Emmy, once again pushed to the edge and pretending to sleep (as her slight smile reveals). Known only as a small contact print, the picture has a very narrow depth of field, with fuzzy objects cut off in the foreground and even Emmy's face slightly softened. It is for all intents and purposes a fairly close-up snapshot, marking Stieglitz's attempt at bonding with his daughter even though his wife remains distant and downright homely. The claim that he took The Steerage on the third day of what was a six-day eastward passage to Plymouth cannot be upheld. With characteristic attention to the weather at the time of shooting, Stieglitz observed: "The sea wasn't particularly rough. The sky was clear. The ship was driving into the wind-a rather brisk wind." As Beaumont Newhall first noticed (and as anyone who has taken a transatlantic crossing in early summer knows), the people wearing thin shawls and straw boaters and the girl in a long-sleeved cotton dress standing at the foot of the stairs at right show no signs of braving the ferocious cold gusts that whip the bow of a boat in mid-ocean. When the Kaiser Wilhelm II left New York at 7:30 A.M. on May 14, it was 48 degrees; when it arrived in Plymouth on May 20 or May 21, the weather was unusually cold-not above the low fifties, seemingly much colder than what is suggested in the picture. Furthermore, as Newhall deduced, the direction of the shadows cast by the railing of the gangplank fall to the right, which in the northern hemisphere during the summer is possible only if the bow of the boat is facing west, not east. Newhall concluded that the ship was probably docked off Plymouth, where it had to be reached by tenders since the dock area was too shallow. However, there is no reason that the boat could not have been moving slowly out of Hoboken or even berthed in Cherbourg, where the Stieglitz family descended. The gazes of the press of figures in the upper right of the photograph suggest that they were within sight of a landmass (or another point of interest) off to the right. All that can be safely determined is that the ship was not moving in mid-ocean at the time the shutter was released and that, once again, Stieglitz's memories are approximations, despite his inclusion of what seem to be very specific and factually corroborating details. Stieglitz uses his distaste for his wife's world to justify his wandering as far forward as possible on the upper promenade deck, where, alone, he encountered the steerage passengers. His emphasis on the accidental quality of this vision (he called it "a spontaneous discovery" and titled his account of its making "a happening") echoes the rhetoric surrounding the handheld camera, which was touted as mobile, able to capture spontaneous scenes, and unobtrusive, in contrast to larger-format, tripod-bound view cameras. In his creation story, Stieglitz is compelled to figure the discovery of his subject as somehow divine, beyond his conscious control, and thus predestined and magical. Had he been carrying a smaller Brownie, he could have shot the scene immediately, but the sense of overcoming adversity would not have been as strong. The prey had to freeze for several minutes until the hunter had gotten his gun (or in this case the clunky Graflex back in his cabin). The tension mounted; the stakes were high with only one plate remaining. Invoking orgasmic release, Stieglitz described the triggering of the shutter: "My heart thumping. I had never heard my heart thump before. Had I gotten my picture?" The only problem with this account of visceral excitement and successful preservation of a once-in-a-lifetime feeling is that it isn't true. Stieglitz had shot this picture before, or at least this part of the boat (figure 8). In late October 1904, he and his family had taken the Kaiser Wilhelm II back from Southampton to New York; they may have taken the same boat on the eastbound trip. Moving to the bow while the crew was casting the anchor prior to landing, Stieglitz stood on the port side of the topmost deck (at the level of the captain's quarters) and looked down at a sailor adjusting the rigging. The steerage passengers were gathered in the same areas as in 1907: the forecastle deck at the bow of the ship and the deck immediately above their crowded sleeping quarters. But they were pushed to the right side of the composition and subjected to the greater blurriness that marked the exposure as a whole (and that was increased in the translation of the negative to a photogravure, published in Camera Work in 1905). Continuing the process of giving his prints generic titles that alluded to his temporal and geographical location (Mid-Ocean, Outward Bound, On the Ferry Boat, or Snapshot-From My Window-Berlin), Stieglitz named this work Nearing Land. The silhouetted laboring sailor, the mulling crowd of steerage passengers, the triangle of water, the emphatic line of the anchor chain, and the slip of land on the horizon were gathered together to paint the mood of an exciting moment of arrival. No single element was given primacy, in either the composition or the title. Stieglitz did not photographically "see" the steerage passengers in 1904, but they must have at some level left a trace in his memory. When he decided not to visit the caf√©s, reading room, or smoking salon and strode away from the sheltered areas where his fellow first-class passengers had claimed deck chairs, he knew where he was going. Classes were rigorously segregated on ocean liners, so that steerage passengers were crowded below deck in the front of the ship, had no dining hall (and were thus fed in the open area shown in Stieglitz's photograph), and were forbidden to mount the two stairs that led from the main deck to the upper promenade deck. Similarly, Stieglitz was not allowed physically to enter the steerage quarters or the bow of the ship, but he chose to walk along the upper promenade deck, which extended slightly farther toward the bow than the two decks above it. In 1904 he had shot on the port side of a deck that was probably two levels above the steerage area so that he captured more of the bow and looked down on the steerage passengers gathered on the forecastle. In 1907, he moved one deck lower and to the starboard side, adjacent to one of the two stairs that descended to his subjects. This was as close as he could get to them. Stieglitz wrote, "I longed to escape from my surroundings and join those people," and that longing found expression in the way he transformed the scene by using a very long lens to allow him to overcome the spatial limits imposed on him by the class-based rules of the ship. As a comparison with the floor plan of the Kaiser Wilhelm II makes clear (figure 9), the apparent distance between the foremast on the left (which Stieglitz erroneously refers to as a funnel) and the railing of what he dubs the "upper steerage deck" (forecastle deck) is radically compressed in the photograph. The distance between where Stieglitz was standing and the upper steerage deck was about twenty meters, with the hatch down into the steerage dormitories in fact behind the mast in the area lost in shadows. By using a long lens with a narrow angle of vision, Stieglitz isolated a swath, some twenty feet wide, of the activities on the steerage decks and thus pulled the figures closer to the viewer, who could then study their clothing and facial expressions without being physically next to them. 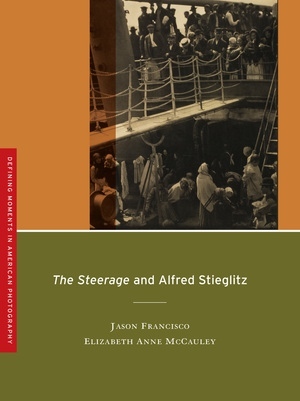 In choosing to shoot from the deck reserved for the first- and second-class passengers looking down into the only part of steerage activity that was visible to him, Stieglitz entered into a dialogue with several decades of representations of immigrants in popular prose, photography, and illustrations. Most elite passengers knew about the details of crossing by steerage from the point of view of bourgeois journalists who reported from the outside, interviewing government officials, gathering statistics, and occasionally conversing with former passengers who spoke English and had succeeded in the New World. They might have acted like the "first cabin lady" addressed in the opening section of Edward Steiner's book of 1906, On the Trail of the Immigrant, who threw down chocolates to the "frowsy headed, ill clothed women, the men who looked so hungry and so greedy." Most commercial photographs of steerage passengers were made from this high vantage point, such as the Underwood and Underwood stereograph from 1904 that figures early in Steiner's book (figure 10). The foreground railing at once served as a protective barrier between the camera (and presumed viewer) and the crowd purposely gathered below, most of whom acknowledged the camera's presence without asserting notably individual reactions or identities. It was in fact this distance between a single, elite viewer (implicitly defined by the camera's monocular way of recording and specific placement) and the anonymous immigrant mass that the book was designed to break down by describing the actual life beneath the deck and following a group of immigrants into their new homes in Lower East Side ghettos. When, in 1907, Alfred Stieglitz took a simple picture of passengers on a ship bound for Europe, he could not have known that The Steerage, as it was soon called, would become a modernist icon and, from today’s vantage, arguably the most famous photograph made by an American photographer. In complementary essays, a photo historian and a photographer reassess this important picture, rediscovering the complex social and aesthetic ideas that informed it and explaining how over the years it has achieved its status as a masterpiece. What aspects of Stieglitz’s ideas and sometimes-murky ambitions help us understand the picture’s achievements? How should we assess the photograph in relation to Stieglitz’s many writings about it? The authors of this book explore what The Steerage might mean in at least two senses—by itself, as a grand and self-sufficient work, and also ineluctably bound up with the many stories told about it. They make the photograph, today, what Stieglitz himself made it over the years—a photo-text work. Jason Francisco is an acclaimed photographer and the Chair of the Visual Arts Department at Emory University. He is the author of Far From Zion: Jews, Diaspora, Memory (Stanford, 2006). Elizabeth Anne McCauley is David H. McAlpin Professor of the History of Photography and Modern Art at Princeton University and the author of Industrial Madness: Commercial Photography in Paris 1848-71 (Yale, 1994). “Alfred Stieglitz’s The Steerage (1907) is one of the most famous images of the twentieth century, and one which raises complex issues regarding art photography and subject matter. The pairing of Anne MacCauley’s well-contextualized historical analysis with Jason Francisco’s more philosophical and poetic reading gives great insight into this important photograph. Together, they offer a new and fascinating take on a canonical work.”—Kim Sichel, author of Germaine Krull: Photographer of Modernity.